Capoeira, a profoundly fun way of looking at the world from upside down. Capoeira is for everyone of all ages, shapes and sizes. No experience required. You will be introduced to the basic movements, music, philosophy and fundamentals of capoeira while building endurance, flexibility, strength and rhythm. First class is free! No experience required. Just show up to class ready to train and with an open mind. 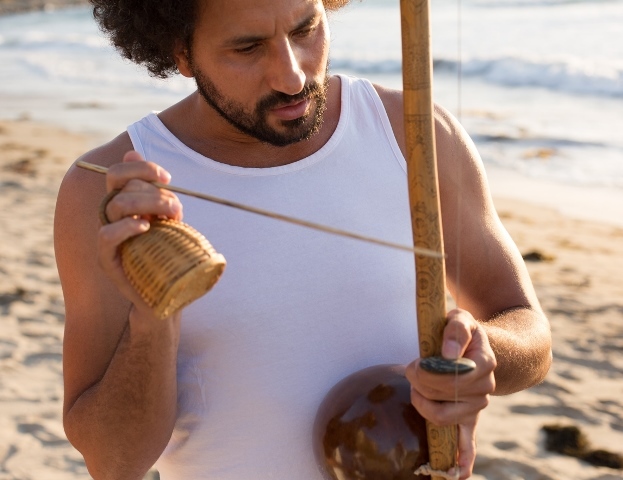 In May 2010, with the encouragement of his students and mentors, Varal opened ArteLuta Capoeira Academy in Lomita, CA, together with his wife Monica, with the mission of teaching, expanding and preserving the values, history, culture and legacy of the art of capoeira – bringing people together and changing lives along the way. Monica began her capoeira journey around 2001 in Albuquerque, NM under (now) Contra-Mestre Maluco, student of Mestre Acordeon (UCA). She continued training in California and Brazil, and around 2009 began training exclusively under CM Varal. Capoeira is an Afro-Brazilian martial art that mixes dance and acrobatic movements with the fight. It uses live music, singing and playfulness of the dance to disguise the fight or martial art. There are many benefits to practicing capoeira: Flexibility • Happiness • Philosophy • Self defense • Self confidence • Body awareness • Build Muscle • Improved balance • Faster reflexes • Community • Musicality and more. Only myth surrounds the true origins, birthplace and influences of capoeira because limited evidence exists to support the various theories. Some believe that the seed of capoeira was planted in Africa, but was cultivated in Brazil. Many contend that capoeira was developed in the senzalas, or slave quarters, where enslaved African lived in Brazil. What people are saying about ArteLuta Capoeira. Having trained capoeira with a variety of teachers, Varal definitely is top notch. The classes are smaller, so there is plenty of one on one training, he’s patient with beginners and good at pushing his more advanced students to become better. They are very good at keeping the class feeling more like a family than a structured class of strangers. Great school for young and old alike! I’ve been part of ArteLuta for a year and a half, and would recommend anyone interested to give it a try. [Contra-Mestre] Varal & Monica know how to help us learn all the various aspects of this fantastic practice. Plus, you get an awesome community as a benefit of your time spent here. Varal truly embodies capoeira as a way of life. Arteluta Capoeira has reinforced culture, discipline, and life lessons through an instructive and caring family atmosphere and community. Our family has had the beautiful and unique opportunity to experience Brazil in the South Bay. Ask us about our school, class schedule, prices, or upcoming events. We would love to hear from you.